Netherlands Antilles : When and where to go? 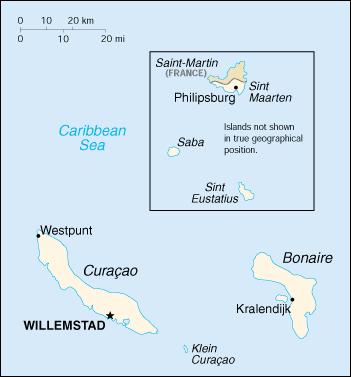 The Netherlands Antilles suffers from a tropical climate, with a more humid atmosphere and risks of cyclones for the Windward Islands between August and October: the rainy season runs from June to October. The Leeward Islands experience warmer and sunny weather, with an average of 27 ° C throughout the year and a very short rainy season between October and December. For a discovery of all the islands, it is better to prefer a stay between February and April. Aruba: it is the smallest of the Leeward Islands; Fairly flat and very arid, it has about 110,000 inhabitants. There is little vegetation other than cacti, and very beautiful beaches of white sand. Its highest point is 188 meters (Mount Jamanota). The tourists who visit the island are mainly American, Venezuelan and Dutch, and they enjoy the sunny climate and paradisiacal landscapes. To see: the orange houses of the capital, the chapel of Alto Vista and its bright yellow, the flamingos of the national park. Things to do: snorkeling to observe multicolored fish, surfing, windsurfing. Bonaire: the largest of the Leeward Islands has fabulous diving sites where abundant black corals, but also wild donkeys and numerous pink flamingos abound. Kralendijk, the only city on the island, has just over 3000 inhabitants, and you will notice its yellow houses with red roofs, very characteristic. Curaçao: first visit Willemstad, the main city, nicknamed the Amsterdam of the Tropics, with its pretty harbor and its colored houses facades. The population comprises a population of multiple origins, including a majority of African origin. The highest point of the island is the Christoffelberg, at 375 meters above sea level. Formerly a hunt for pirates, it was also the world center of the cocoa trade. Today, there are many creole creations, dances and a very mixed cuisine, and an economy that relies mainly on tourism, finance (it is a tax haven) and the oil industry. Several museums are to be visited. Saint-Martin: close to Saint-Barth, this wind island is partly a French community, and its great interest lies in the fauna and flora that populate its coral reefs and mangroves. Saint-Eustache: to the south of the island, Oranjestad, with its fort, built of volcanic stones, where the canons remain in perfect condition, and beautiful colonial houses of the 18th century. You can also visit the botanical gardens, the museum housed in the former Simon Docker House, and for diving enthusiasts the remains of the many 17th and 18th century boats that sank all around the island. The highest point is the Quill, at 602 meters. No visa is required for a stay of less than 3 months, only a valid passport is required. The current currency is the West Indian guilder (ANG), except in Saba where it is the US dollar (USD). We land at the Princess Julian airport in Sint Maarten, but we can reach the other islands by plane. To get around you can rent a car, but there is also good public transport (bus) on some islands, such as Curaçao. The bike can also be used very easily. For a basic budget, count between $ 30 and $ 40 per day. There are no particular health problems (good protection from the sun) or safety. To bring back, the Curaçao liqueur of course!